The new building to house the College of Hawaiian Language promises to be both functional and extraordinarily beautiful, with profound symbolic and spiritual elements. 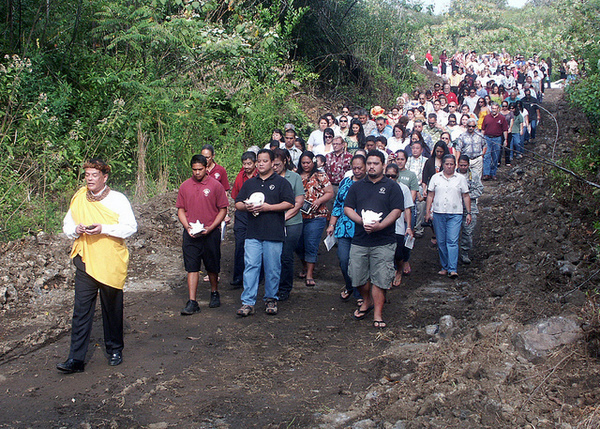 UH Hilo students, faculty, staff, administrators and members of the community walk to the piko or central point of the parcel for the groundbreaking of UH Hilo’s new College of Hawaiian Language building. At left is Kalena Silva, director of the college. A bilingual blessing and groundbreaking was held on Saturday for permanent facilities for University of Hawai‘i at Hilo’s Ka Haka ‘Ula O Ke‘elikōlani College of Hawaiian Language. The opening ceremonies were conducted in Hawaiian. 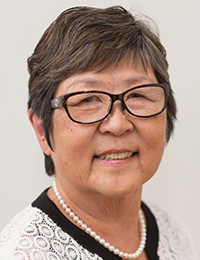 A genealogical presentation acknowledged native speakers who assisted in Hawaiian language teaching at UH Hilo and Hawai‘i Community College dating back to 1960. Lydia Makuakane, the eldest living of those native speakers, led a procession to the groundbreaking site, where she turned the soil at the piko or central core of the parcel. The event concluded with remarks by representatives from the UH and elected officials. 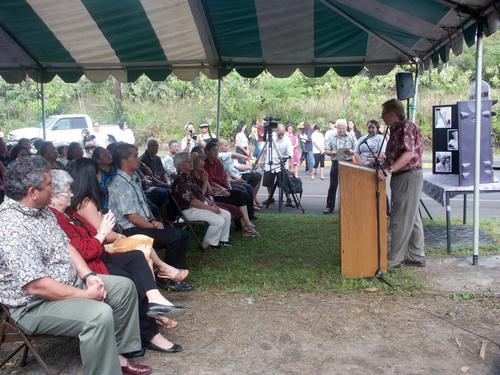 UH Hilo Chancellor Donald Straney addresses the audience at groundbreaking ceremonies. Seated at left are Hawai’i County Mayor Billy Kenoi, and to his left, UH President MRC Greenwood. Gerald De Mello, director of university relations, said the project enjoyed widespread support, but it took a coordinated team effort to secure the funding. Kalena Silva, director of the college, says the new building will not only address the college’s growing pains but lay a foundation for the future. The building already has won critical acclaim by capturing the 2010 American Institute of Architects Honolulu Design Award in the category of “Commissioned Work to be Built.” The design by WCIT Architects of Honolulu features spectacular landscape, mountain and ocean views, and designs which reflect Native Hawaiian culture and the Big Island’s natural resources. The college awarded UH Hilo’s first master’s and PhD degrees as it gained national prominence as a leader in indigenous language and cultural revitalization, added new programs like linguistics, and witnessed a surge in enrollment. Link to video of the event. Photos of the event by Walter Dudoit.